To configure these links, it’s a fairly straightforward process. 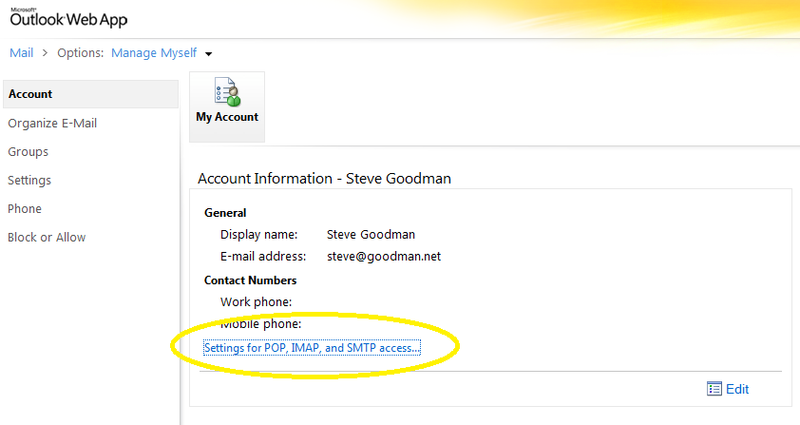 Before you begin, you need to know what the settings should be and in the case of the SMTP settings, which receive connector on which Hub Transport this relates to. 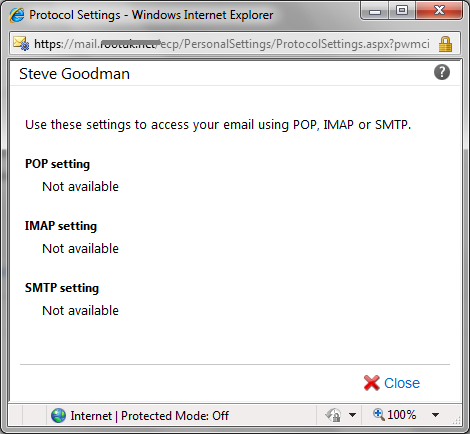 First, you configure the Client Access servers for the POP and IMAP settings, using the Set-POPSettings and Set-IMAPSettings cmdlets with the -ExternalConnectionSettings parameter. For each protocol you specify a colon-separated list of values for the ExternalConnectionSettings. For POP3 with TLS, this might be ”casserver.contoso.com:110:tls” or POP3 with SSL might be ”casserver.contoso.com:995:ssl”. IMAP with TLS might be ”casserver.contoso.com:143:tls” and IMAP with SSL might be ”casserver.contoso.com:993:ssl”. It’s important to remember, you need to run the command on all Client Access servers users will access. Next, you need to allow the receive connector that you want ”published” to advertise it’s settings. You do this with the Set-ReceiveConnector cmdlet specifying the -AdvertiseClientSettings:$true parameter and value. For further reading check out Set-IMAPSettings, Set-POPSettings and Set-ReceiveConnector. Some IMAP-clients (Thunderbird in some cases) have problem with corrupt attachments using Exchange IMAP. One possible reason is how Exchange delivers MIME-message to users. In exchange 2003 you could set an option on IMAP – ”Fast message retrieval” and it makes IMAP answer faster to clients with MIME-messages. In Exchange 2010 this option is set thru powershell with Set-imapsettings and it is now called ”EnableExactRFC822Size”. When this is enabled it will give IMAP-clients an exact size of each MIME-message content and not an approximate size as default. Old IMAP-clients can not handle an approximate size of MIME messages and there for shows messages as corrupt. As Marek writes below: ”MS Exchange violates RFC and provides only approximate size of the message for ’performance reasons'”. A plot from technet and powershell-command ”set-imapsettings”. The EnableExactRFC822Size parameter calculates the exact size of each MIME message that can be retrieved from the server. When you set this parameter to $true, the exact size of MIME messages stored on the Exchange server is available to POP3 or IMAP4 client programs that rely on knowing the exact size of each MIME message. This parameter is set to $false by default. If you don’t set this option to $true, the size of each MIME message that the Exchange server returns to POP3 and IMAP4 client programs may be slightly different than the exact size of the message. Because setting this option to $true can negatively affect performance, you should only use this option if many of your users are using a client that requires knowing the exact size of MIME messages. There are several reasons and also few possible solutions for solving this issue. So sticking with this value is not a good idea. It is also discouraged by IETF author in RFC 2683 http://tools.ietf.org/html/rfc2683 section 3.4.5. – follow RFC 2683 recommendations and in Thunderbird fix the code and use message size provided by ”FETCH RFC822.SIZE” command only for informational purposes. For message size validation and possibly truncation use e.g. size reported by ”FETCH RFC822” as it seems to be correct value all the time. In Thunderbird, there is a problem where attachments on received e-mail messages are corrupted, and images in e-mail messages only partially load. This is caused by Exchange reporting attachment sizes incorrectly, so when Thunderbird breaks the message into chunks it doesn’t download all of them. Exchange has a bug in the IMAP server implementation that reports the wrong size for messages and attachments. There is a workaround that causes Thunderbird to ignore the erroneous information. Warning: This may result in any tags you have set disappearing. If you use Thunderbird’s tagging you should back up your profile before doing the following (your profile is in the ~/.mozilla-thunderbird directory by default). Thunderbird will now download attachments as one block, avoiding the bad attachment size problem. Exchange 2010 no longer has the setting. Exchange 2003 IMAP4 client use the streaming store (.stm file) for reading and writing mailbox data that is stored as MIME content. 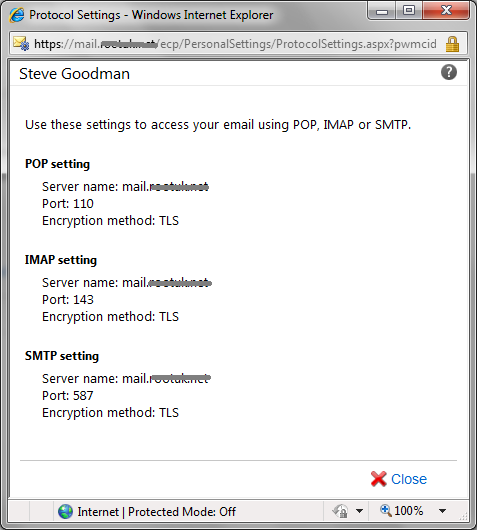 If you use the Move Mailbox functionality in Exchange System Manager or Active Directory Users and Computers to move a mailbox that is accessed by an IMAP4 client, the data in the moved mailbox is promoted into the Extensible Storage Engine store (.edb file), and the content is converted from MIME content to MAPI content. When the IMAP4 client logs on, exact message sizes are calculated, and MAPI-to-MIME conversion of the mailbox data occurs in memory and on the disk of the server. Fast message retrieval improves performance of the MAPI-to-MIME conversion. Exchange 2010 no longer use .stm file. Fetching the body of an e-mail message was also possible in Exchange server 2003 SP2, but has been improved further with Exchange Server 2007. For example, you no longer need to select Mark for download or click Get the rest of this message, instead this will happen automatically in the background and thereby make the end-user experience even better.